The on 23 April 2018 said on that the world today faces similar challenges to the context that gave birth to the Treaty on the Non-Proliferation of Nuclear Weapons (NPT), and that the threat of use of nuclear weapons is growing. 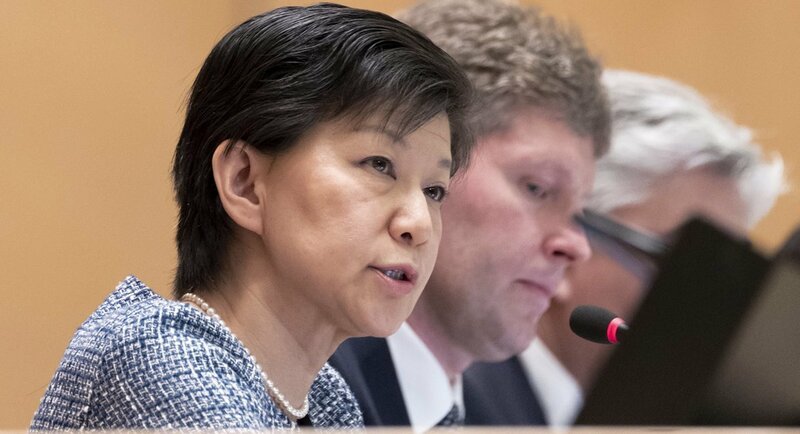 UN Photo/Jean-Marc Ferre | Izumi Nakamitsu, Under-Secretary-General and High Representative for Disarmament Affairs addresses the opening session of the Treaty of the Non-Proliferation of Nuclear Weapons in Geneva. “The geopolitical environment is deteriorating. Some of the most important instruments and agreements that comprise our collective security framework are being eroded. Rhetoric about the necessity and utility of nuclear weapons is on the rise. Modernization programmes by nuclear-weapon States are leading to what many see as a new qualitative arms race,” said Izumi Nakamitsu. Nakamitsu, the UN High Representative for Disarmament Affairs, was among the speakers at the opening of the preparatory meeting that began today in Geneva for the 2020 NPT review conference. The Treaty entered into force in 1970 at the height of the Cold War and is regarded as the cornerstone of the global nuclear non-proliferation regime and an essential foundation for the pursuit of nuclear disarmament. It was designed to prevent the spread of nuclear weapons, to further the goals of nuclear disarmament and general and complete disarmament, and to promote cooperation in the peaceful uses of nuclear energy. “Half a century later the NPT has transcended its initial purpose and has become a core component of our international architecture – the cornerstone of the non-proliferation regime and an essential framework for the pursuit of nuclear disarmament,” the High Representative noted. “Its near universal membership, legally binding commitment to disarmament and verifiable non-proliferation safeguards undergird its status as one of the most successful and credible multilateral security instruments,” she stated. Today’s meeting takes place just days after the announcement by the Democratic People’s Republic of Korea (DPRK) to freeze its ballistic missile programme and nuclear tests, a decision that has been welcomed by the UN. She added that the Secretary-General looks forward to a positive outcome of the Inter-Korean Summit and hopes for early agreement on a framework for resumption of negotiations leading to verifiable denuclearization and sustainable peace on the Korean Peninsula. (SOURCE: UN).